Surrounded by centrifuges, micro-pipettes and other scientific instruments, three high school students were arguing and joking. “I’m sweeter,” said Kheane Quezon, 17. “I’m sweet too,” said Jurelle Santonia, also 17. “But he’s the sweetest,” said Adriana Chavez, 18, pointing to Kheane. 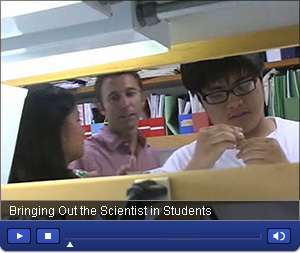 Watch a video profiling the Socrates Fellows Program, which aims to get high school students excited about science. The trio, made up of students and alums of Southwest High School in San Diego, wasn’t just horsing around. They were competing to find out who broke down the sugar in their food most efficiently and were arguing about the results. The experiment was designed by a UC San Diego graduate student and a high school teacher in the Sweetwater Union High School District who are taking part in an innovative program launched this summer on campus. The Socrates Fellows Program was funded by a $3 million grant from the National Science Foundation. The program’s goals include providing training for graduate students; enriching the experience of high school science teachers; and, ultimately, attracting more high school students to higher education and a career in the sciences. “What's exciting about this grant is that we hope it will help us address a major national problem, which is that there are not enough science students in the science pipeline,” said Maarten Chrispeels, a UCSD biology professor and co-principal investigator of the Socrates grant. The program pairs high school teachers with graduate students working on their doctorates. Nine Socrates fellows at UCSD will work in high school classrooms for about a dozen hours a week this coming school year. The hope is that the grad students will inspire high schoolers to study science down the road. Grad students also will share their knowledge of science with teachers, who in turn will share classroom management tips. The Socrates program was inspired by BioBridge, a science outreach program that started in the lab of UCSD researcher Roger Tsien, who won the Nobel Prize in Chemistry Oct. 8. The teachers and graduate students will develop experiments based on cutting-edge science, said Loren Thompson, assistant vice chancellor of Student Educational Advancement at UCSD. Ultimately, the goal is to reach thousands of students by spreading these experiments districtwide in the San Diego, Oceanside, Sweetwater and Grossmont school districts, Thompson said. “It’s going to impact thousands of children who could have wonderful careers in science, if only they could get excited about science,” he added. Johnnie Lyman, a graduate student at UCSD’s Scripps Institution of Oceanography, shows high school students ocean core samples. Meanwhile, the program also will allow graduate students to improve their teaching skills, said Kim Barrett, UCSD’s dean of Graduate Studies and the other principal investigator on the Socrates grant. Barrett recalled her first class as a university professor. “I showed up in the classroom and no one told me how to teach,” she said. “I had no formal training.” More training is precisely the reason why several Socrates fellows said they signed up for the program. “I don’t want to be that teacher who doesn’t know how to teach,” said Johnnie Lyman, a graduate student at UCSD’s Scripps Institution of Oceanography. She is co-teaching students at Mira Mesa High School this year. Alfred Chappell, who works with Barrett in her lab, also was looking for more hands-on experiences in the classroom. He is co-teaching at Southwest High in the Sweetwater Union High School District. Working with high school seniors isn’t that different from instructing university freshmen and sophomores, Chappell said. He plans to teach at an undergraduate college after earning his doctorate and said he wanted to know how to do a better job at engaging his students. “I wanted to work with teachers and get some insights from them as far as how they approach instruction and also have some experience developing interactions with students,” he said. On a sunny August afternoon, Chappell was put to the test when he found himself alone in Barrett’s lab with six high school students, who were taking part in a campus outreach program. He was test-driving an activity that he and his teaching partner, David Buse, had come up with. High school students take part in an experiment that will help them find out how good they are at breaking down starch. Chappell divided students in two groups that would compete against each other in an experiment dubbed “the amazing amylase race.” Amylase is an enzyme found in human saliva that breaks down starch into sugar. Because of the way amylase production is coded in our genes, different individuals will produce different amounts of the enzyme, Chappell explained. During the experiment, students would find out at what rate their saliva digested starch and how much amylase they produced. So, high schoolers chewed on starch-rich crackers and spat into vials. Then the process got more complex. The students’ saliva was mixed with Benedict’s solution, which is used to detect the presence of sugars, including glucose. The resulting cocktail was then put through a centrifuge and a spectrometer. Finally, high school students used some nifty math to determine the amount of amylase in their saliva. And at some point, they started arguing about who was sweeter. The activity, they said, had been a success. Students’ enthusiasm must have been good news for Chappell. He and other Socrates fellows had spent weeks concocting experiments, which they are taking to high school classrooms this fall. Down at UCSD’s Scripps Institution of Oceanography, graduate student Lyman and teacher Chris Everett, from Mira Mesa High School, decided to use for their experiment an ocean core, a cylinder that holds samples of ocean floor collected off the San Diego coast, near the Coronado Islands. Mira Mesa High School teacher Chris Everett works with UCSD grad student Lyman. Lyman and Everett plan to teach students how to handle samples from the core, washing them, drying them and looking at them through microscopes. The cores, it turns out, yield important information about climate change on our planet and right in our backyard. The cores hold single-cell, golf-ball-shaped organisms called foraminifera. As waters warm, different species start appearing in the core samples. Lyman and Everett hope that tracking the changes will make students aware that global warming is happening right in their backyard. “One of the things that we want to get across working with a local sample and teaching them local ecology is that their world, the world they're familiar with and have lived in their whole lives, is changing also,” said Lyman. Everett, her teaching partner, said he hopes the Socrates program would allow him to bring real, cutting-edge science to his students at Mira Mesa High. He teaches biology and earth sciences for ninth- through 11th-grade. He will be able to stage unique experiments in his classroom, he said. The program also allows his students to meet Lyman, a role model who is sure to get them excited about science—and going to college, he added. 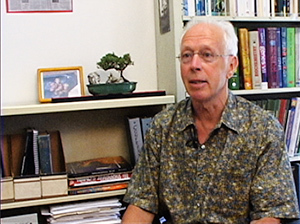 Professor Maarten Chrispeels is one of the co-principal investigators on the Socrates grant. Breaking down stereotypes about scientists is indeed another benefit of the program, said Chrispeels, the Socrates’ co-principal investigator. “One way to get them excited about science is not to teach them from textbooks but actually to show them what young scientists look like and that they're not all white-haired European professors,” he said. The program also fulfills UCSD’s outreach mission, said Dean of Graduate Studies Barrett, by bringing graduate students into high schools that often have a high percentage of under-represented students. “So, the university will become not just this faceless enclave in La Jolla,” the dean said. Both Barrett and Chrispeels said they also hoped the grant would help change the culture of the university. Graduate students are currently trained to become top-flight researchers. But the reality is that many of them will hold other jobs after earning their doctorate, Barrett said. “There’s no way that every graduate student training today will be a professor at a research institution tomorrow,” she said. The program will be successful if more students enter science careers and if graduate students acquire new skills and new ideas, which are valued by future employers, Chrispeels said. It also will be successful if more high school students learn more up-to-date science and get excited about science, said Jeremy Babendure, director of UCSD’s BioBridge program, which inspired the creation of the Socrates Fellows project. “It’s going to be really exciting to see what’s going on in the schools,” he said.